Welcome to the second part of our Holiday 2010 shopping guides. We started with a look at notebooks, in part because they're a popular item but mostly because Dustin just happened to be quicker to the draw when it was time to put together a shopping guide. While notebook and laptop sales continue to grow and now account for more units than desktops, every one of the editors at AnandTech still packs a desktop (or two or three or...) for those times when performance and screen size take priority over portability. For this guide, we're taking a break from our traditional buyers' guides and giving each editor a chance to put together a system that they would recommend. There's definitely some overlap in taste and intended use, though, so we also broke things down into broad categories to make sure we had representatives for each market. From pure budget builds through the midrange and up to the high-end, we'll provide options. We'll also have a couple different takes on HTPC and a discussion of overclocking. While we won't be able to dedicate lengthy portions of the article to each specific component, you can also consider the individual parts as recommended upgrades/purchases in their own right. Before we get to the guides, we do want to take a minute to discuss the market as a whole. We've said in the past that the right time to build is whenever you feel your current system isn't meeting your needs/wants. If you happen to be in that situation, then normally we'd say go ahead and spec out a new system and take the plunge. Waiting for the Next Big Thing™ can be an exercise in futility, as new parts are always just around the corner—new processors, chipsets, sockets, graphics cards, SSDs, etc. And the fact is, you can still put together a great system right now that will continue to be great in three months, even if something faster comes along. We're reaching the stage where even PCs that are several years old (yeah, ancient!) are still more than fast enough for 95% of users. That old Core 2 Duo E6600 plugging along at 2.4GHz may not stand up well to the latest desktops in raw performance, but come on: it can still run circles around most laptops, it can handle HD YouTube content, and with an appropriate graphics card it can even manage medium to high detail games! [Jarred: Yes, I've got just such a PC in my living room pulling duty as an HTPC, never mind the old single-core Athlon 64 3800+ running in my eight-years-old daughter's computer!] So sure, new parts are just around the corner once again, but a good PC today will continue to be plenty fast for a couple years at least. All that said, we do need to take a moment to name drop: Sandy Bridge. Our early testing shows it to be around 25% faster than the currently shipping parts, especially Lynnfield and Clarkdale. It will have better multi-threaded and single-threaded performance, and while idle power may not change much the load power consumption should drop quite a bit. Anand measured 121W for the entire system under load with an i5 2400 (3.1GHz), and that's 8% less power while being 23% faster than the i5-760 it replaces. If that pattern holds up, we're looking at overall performance per watt going up by almost 35%. To make matters worse, Sandy Bridge will also usher in a new socket, chipset, and motherboards: goodbye 1156, hello 1155! If you're looking to get the best performance from the most efficient architecture and you don't want your motherboard outdated next month, it will likely be worth waiting for. Sandy Bridge isn't the only new component coming, naturally. The SSD companies are talking about several new controllers that will improve performance and perhaps even lower cost in the not-so-distant future. AMD just launched their HD 6800 cards, but it's no secret that the 6800 series is the replacement for the 5700 and Cayman (6900 series) is coming real soon. How fast will it be and how much will it cost? You'll have to wait a bit longer to find out. Likewise, NVIDIA just released GF110/GTX 580; we will probably see trickle-down parts like a 570 before long as well. AMD will also have Bulldozer launching in 2011, probably in the first half of the year but likely in the latter part of Q2, so you still have maybe six months to wait. Brazos isn't going to set the desktop world on fire (though it ought to do well in nettops and HTPCs), but Bulldozer might be able to hang with Sandy Bridge. It will also require a new motherboard/socket (AM3r2), so whether you're going Intel or AMD, the bleeding edge is about to switch sockets next year. We're still going to give you a bunch of current system builds, regardless of the above, and most of the components can easily transfer over to a new Sandy Bridge or Bulldozer setup when those arrive. Whether you choose to wait or buy now and then upgrade (or buy again) later is up to you. 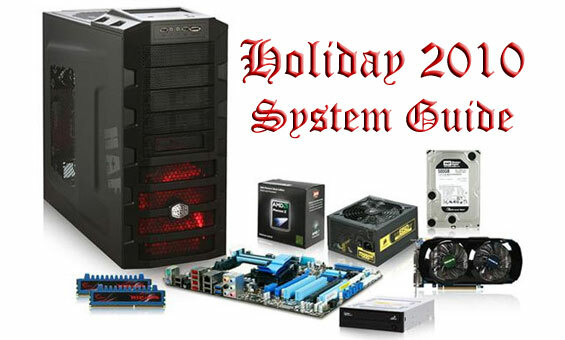 So here's our holiday system guide picks, starting with the budget builds, moving through midrange, overclocking, and high-end, and wrapping up with the HTPC options. There's something for everyone, and even if you're happy with your current system you might have a friend or family member that would benefit from the content. There's no conclusion, so enjoy our picks and feel free to join the conversation in the comments below. Honestly, the AMD/Intel stuff was in a large part based on editor personal preference. For a budget build, it's hard to match AMD, but ultimately it's just a $40 upgrade to Intel. Some of us really like AMD, some of us really prefer to run Intel. Funny thing is that I'm more of an Intel guy but decided that AMD made the most sense for what I was building, and Vivek definitely wanted to do Intel. Also consider that we didn't want a ton of overlap; if you asked each of us for a system we would REALLY build, no one would put together a dream setup, and likewise few of us would go budget; you'd get all sorts of $700-$1300 builds. Why in the world do you need to make separate Intel/AMD builds to keep the fanboys happy, and why don't you bother to include AMD/Nvidia splits as well? Second, I have to question pairing a GTX580 with a 1920x1200 monitor. While it does let you play crysis2 with absolutely everything turned on, it will be spinning its wheels doing everything else. While trying to build a decent $900 eyefinity* system might require raiding the budget from other components, the end result (5' of monitor instead of a big port hole) is likely superior to any single monitor 1920x1200 (even 24" IPS and a GPU that *never* drops below 60fps). "On every system I've built in recent memory, I've gone with an SSD + RAID array of slow but capacious storage; I think the same is best here. Get four or five 1.5TB or higher HDDs of whatever brand makes you feel warmest inside, toss them in a RAID5 set, and enjoy a crap-ton of storage that's fully redundant. I suppose if you're really feeling ultimate, you could get a RAID card instead of using the ICH10R's software fakeRAID, but it probably isn't critical unless you want to eek out everything you can from those mechanical drives." Anand has also added his build, with RAID1. Everything has looked pretty good until this machine. For one, why is a monitor now included? Though I do think it's a good monitor (nice alternative to the dell U2410). But, as a gaming system, why not get 3 24" tn panels for the same price for eyefinity goodness? Also, what is with the use of all the WD drives? They're good drives, but the samsung f3 and f4 drives are just plain faster and don't cost any more.